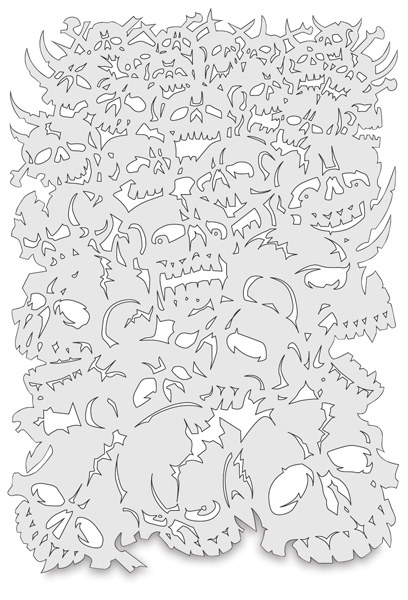 For the post-apocalyptic artist in everyone, Artool SkullMaster Freehand Templates let you spray perfect anatomically correct (well, sort of!) skulls with one deft stroke. The templates are designed by Craig Fraser, in-house airbrusher, pinstriper, and co-designer for Kal Koncepts, a driving force in the automotive and motorcycle kustom paint industry. His original SkullMaster Series was so popular that Fraser went on to design five additional series — Son of, Curse of, Horror of, Return of, and Wrath of — not to mention the Skullduggery Limited Edition Set. 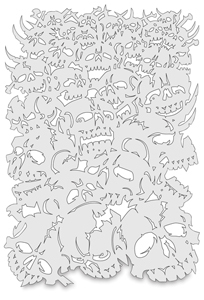 Like all Artool templates, SkullMasters are made out of tough, solvent-proof polymer. They flex and curve around irregular-shaped surfaces and can be flipped to create identical mirror images on convex surfaces. Full size templates measure approximately 8" × 11" (20 cm × 28 cm) while mini templates measure approximately 5" × 7" (13 cm × 18 cm). ®Artool is a registered trademark.® Freehand is a registered trademark. ™ SkullMaster is a trademark.